BEOL Processing on the fab floor, note the hand carried FOUP’s. 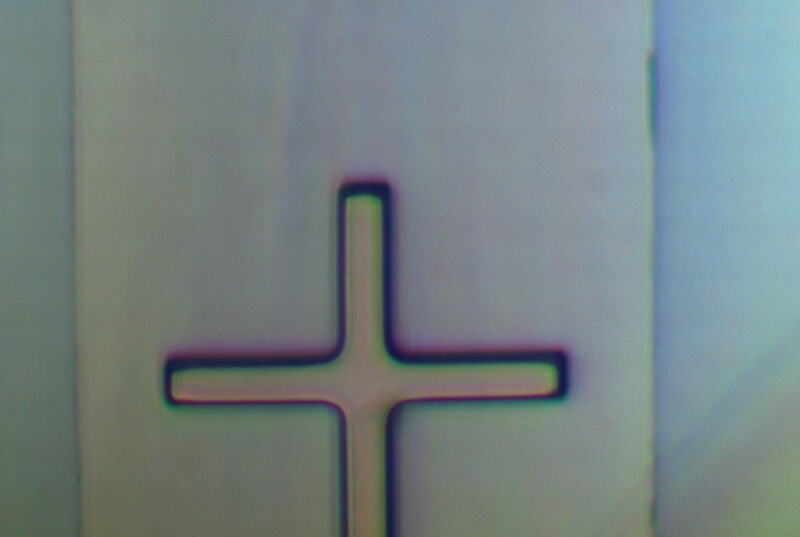 Interconnect requirements for the 22nm technology node and beyond, driven by shrinking FEOL geometry, push the limits of unit process tools for BEOL as well as FEOL. BEOL semiconductor tools for WLCSP (Wafer level chip scale packaging) take advantage of many lithographic techniques utilized in the manufacture of the chip in the Front End of Line (FEOL). 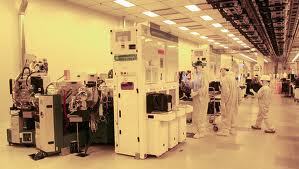 Semiconductor photolithographic processing steps are discussed below. The substrate is automatically withdrawn from a cassette that may be in a SMIF pod. Alternatively for 300mm wafers a FOUP opener may be employed. The substrate is precisely positioned on a vacuum chuck such that the center of the substrate is coincident with the center of rotation of the chuck. Pre-Wet Dispense – The substrate is rotated at a speed of approximately 500 rpm and a pre-wet dispense using the same solvent used in the photoresist, normally NMP or PGMEA is briefly dispensed and “spun” off at a speed of about 1500 rpm. The purpose of this step is to remove any dust particles from the wafer surface that could affect the quality of the deposited film and to effectively pre-wet the surface of the wafer with a monolayer of solvent molecules so that the surface can more readily accept the photoresist. This also has the effect of reducing the quantity of photoresist that needs to be applied thereby reducing chemical costs. The small quantity of solvent used is more than compensated by the reduced quantity of photoresist required. about 1500 rpm and the photoresist is dispensed at the center of the wafer for about 1 second. It is important that this be done immediately after the last Newton ring of solvent has evaporated. 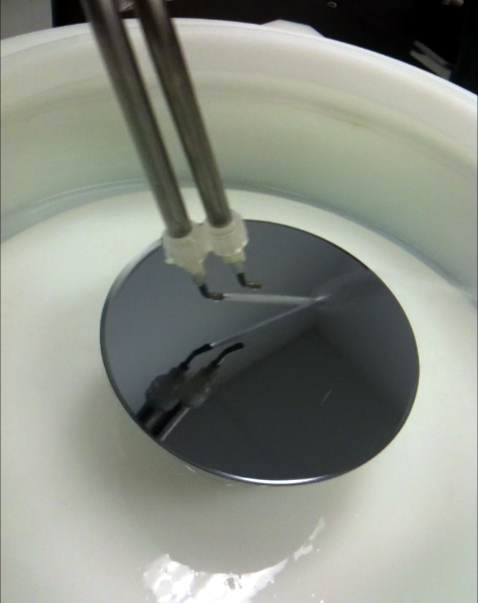 Spinning – The rotational velocity of the substrate is increased to the speed at which the desired photoresist thickness is obtained. This speed will be highly dependent upon the resist viscosity. The acceleration to achieve the desired velocity will be on the order of 4,000 to 8,000 rpm per second. Precise control of both the acceleration and the velocity will determine the uniformity of the film thickness within a given substrate, from substrate to substrate and lot to lot. Bake – The wafer is normally baked on a hot plate after having been coated on the Spin Coater. Some considerations that can be unique to the BEOL process are for the most part owing to the relatively thick films that are used. programmatically lower the pins toward the hot plate either step wise or simply very slowly but controllably and uniformly, this is done with servo motors for best results. the hot plate chamber should eliminate the possibility of solvent reflux on the wafer. This can happen when the effluent solvent condenses on a relatively cold surface in the hot plate oven chamber and can then drip on the product wafer surface. This is best done by ensuring that the effluent is directed only towards surfaces that are nearly as hot as the hot plate and disposed below rather than above the product wafer. The back side of the wafer should be maintained in proximity to the hot plate rather than in direct contact this will minimize cleaning issues and provide superior uniformity, the proximity can be programmable or fixed. The economics of BEOL Wafer processing require both inter-wafer and intra-wafer uniformity. S-Cubed’s experienced BEOL application engineering team can be reached by phone, email, or web contact. We welcome all questions and discussions.